My computer is too slow. I can’t get my work done without being frustrated. A simple and easy way to speed up your computer is to clone your existing Windows or Mac hard drive to a new solid state hard drive. This should also give you peace of mind as it pertains to the local data stored on your computer. We use special software to make an exact copy of your current hard drive onto a new solid state hard drive. Many people think that adding more RAM is the only way to speed up a computer but that is false. There are no moving parts to an SSD. Information is stored in microchips. This affects speed tremendously since your data is not limited by a mechanical arm with a read/write head. Your data is also safer due to this technology. Do I still need to backup my data? 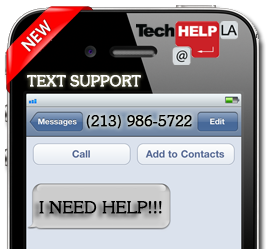 Yes, at Tech Help LA we highly emphasize the importance of backing up your data either locally or even better in a secure cloud such as Carbonite, Google Drive, Microsoft OneDrive, or Dropbox. Even if your data is stored on a solid state drive you still should have a continuous and seamless data backup in place in case of a fire, theft, user error, or physical damage. Contact us for a free phone chat and we can help you plan and schedule cloning your computer to a solid state drive and setting up your continuous back. Author Tech Help LAPosted on March 31, 2017 Categories Backup, backup my files, backup solution, cloud, Cloud computing, data backup, data storage, Data storage device, dropbox, google, google drive, Hard disk drive, Hard Drives, microsoft, Microsoft OneDrive, Microsoft Windows, tech help la, Tech Help LA, tech help la security, tech help los angeles, Tech Help Los Angeles, tech help los angeles security, tech help los angeles web design, tech support la, Tech Support LA, Tech Support Los AngelesTags Do I still need to backup my data?, HARD DRIVE CLONE SOLID STATE, How can I speed up my computer? Don’t fall into the old paradigm of “it will never happen to me.” While there is certainly a chance that you will never have a need for the backups you make of your files, if something does happen to your computer you will certainly be glad that you have them. What is a Backup, Anyway? Backup should be an essential part of your computing experience if you spend great amounts of time on your computer and/or use your computer for important personal or business dealings. There are too many stories of people who have lost all of their files due to system crashes or computer viruses to ignore. When you backup your files, you are storing your files separately from your computer. In this way, if your computer crashes or is infected with a virus that results in a loss of files, you will still have access to your files on backup disks or whatever other backup program you choose to use, such as online backup. You can then restore your files to your computer proper from these backup sources. Don’t fall into the old paradigm of “it will never happen to me.” While there is certainly a chance that you will never have a need for the backups you make of your files, if something does happen to your computer you will certainly be glad that you have them. And you do not have to backup your entire computer, although this is certainly something that many people do, but only the files that are of the most importance to you. Some things are easily replaced, and there is no need to backup these sorts of things, but those irreplaceable documents or files that are yours and yours alone should be saved in a place where they cannot be damaged. That way, no matter what happens to your computer, you can have security in the fact that all of your files are available in backup.